The College of Public Health and Human Sciences is gearing up for several events in recognition of the American Public Health Association’s (APHA) National Public Health Week, April 2-8, 2018. This year’s theme is “Healthiest Nation 2030: Changing Our Future Together.” The annual observance brings together communities across the country to recognize the important contributions of public health and its professionals and highlight issues important to improving the nation’s health. The APHA is highlighting five topics this year ­– behavioral health, communicable diseases, environmental health, injury and violence prevention, and ensuring the right to health. 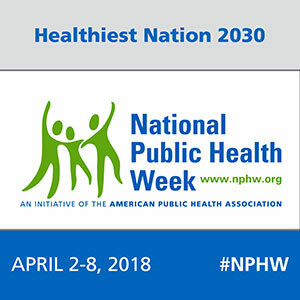 Nicole says that National Public Health Week is important because it brings awareness to public health issues and allows public health officials to connect with their communities. She adds that the club provides students with opportunities to engage in community outreach, volunteering and professional development. Tweet or Instagram a photo and caption that represent what this year’s theme – Changing Our Future Together – means to you. Use #OregonStateNPHW and #NPHW during April 2-8 and enter as many times as you wish. Stop by the SEC and enjoy a healthy snack and gather healthy recipe cards from Food Hero. Learn how to prepare for – and respond to ­– an active shooter situation. Led by Oregon State Police. Join Shelley Su, a toxicologist and senior instructor in Environmental and Occupational Health, for a film screening and discussion. This event is sponsored by the Public Health Club. Pizza will be provided on a first-come, first- served basis, and R.S.V.P. is requested. Join CPHHS Alumna Alana Knudson, Ph.D., program area director in the Public Health Department at NORC at the University of Chicago and co-director of NORC’s Walsh Center for Rural Health Analysis, for a discussion on her path in public health. Join us for the college’s annual graduate student poster session and reception. This is your opportunity to socialize with your colleagues and learn about graduate student research in the CPHHS disciplines. A wine, beer and hors d’oeuvres reception will begin at 5:00 p.m. and the winner of the best poster award will be announced at the event.